True artistic talent can be defined as the ability to take the things you see in your head, and put them on paper — canvas or clay. Not everybody can do it, and among those who can, there are those who simply do it better. These people literally give shape, form and, yes, life, to their own imagination. Alyssa Monks is an American artist from New Jersey, whose work has been featured in art exhibitions all over the world. She first became interested in realistic paintings after noticing that certain “filters” like water, glass, and steam distort visions of the world in a way that makes it easier to capture them on canvas, using oil paints and thick brush strokes. Hopefully, she didn’t discover this while peeping on random people in the shower. Pause is actually just one work in Alyssa Monk’s 2009 series of 21 hyperrealistic paintings depicting people behind water and glass, though it is by far the most representative of her style. For more of Alyssa Monk, be sure to visit her (slightly NSFW) official website. There’s “art” and there is “Art!” (capital A and exclamation mark mandatory.) Witz’s Mosh Pit, from 2001, is planted firmly in the latter category, headbanging like crazy and throwing up the horns. Witz, who in a dim light could easily be confused with the guy who sold you weed in high school (it’s the tattoo sleeves), has put many similar scenes to canvas over the years, but none as realistically intense as Mosh Pit. The only thing this painting is missing to complete the illusion, is that one guy who always inevitably tumbles into a pit, and starts screaming for everyone to stop so he won’t get stomped to death. Wuss. Check out more of Witz’s work here. I’m not entirely sure what an X-Statix is but, after looking at this totally-not-a-photograph by the Canadian painter de Graaf, I know that I like it, removing all doubt that this is true art. Not that there ever was any doubt to begin with. 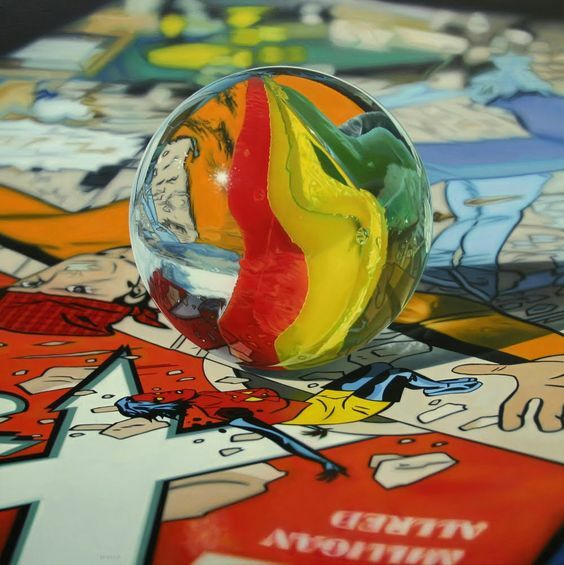 Jason de Graaf’s extensive portfolio of unbelievably detailed, realistic paintings is the very definition of “art,” “talent” and possibly some as-of-yet undetermined mutant power (I’m watching you, de Graaf). His models are exclusively inanimate objects, and a typical motive in his work seems to be water (or other assorted liquids) and reflective, metallic surfaces … which is actually also the basis for my other theory: de Graaf is a sentient robot sent from the future. So you should probably try getting into the good graces of our future robo-overlord, by visiting his website. Another sign of a great artist is the ability to turn everyday objects into things that make us feel, ponder, and reflect on our lives. Case in point: the above loaded dishwasher. Believe it or not, it’s actually an oil painting on canvas, produced by Italian painter Roberto Bernardi, a leading name in the field of photorealistic art. Similarly to Jason de Graaf, Bernardi doesn’t really go for people in his work, concentrating on still life, which he brilliantly translates to canvas with the skill and talent you would expect OF YET ANOTHER KILLER ROBOT SENT FROM THE FUTURE! GOOD GOD, THEY’RE EVERYWHERE! See more of his work here. And be afraid for the future. I’m just going to say it: I’m completely jealous of the Argentinean painter Diego Gravinese and other hyperrealistic painters like him. Whenever I want to see a pretty girl in a bathtub covering herself in milk, I gotta give some shady website my credit card number. But all Diego has to do is close his eyes, visualize the scene exactly as he wants to see it, and then spend weeks (months, more likely,) bringing it to life. Yes, his way is more complicated, and takes way more time, but at least he doesn’t have to have awkward conversations with HIS wife when the monthly Visa bill comes in the mail. See more things Diego doesn’t have to fight over with his wife/girlfriend/whatever at his website. 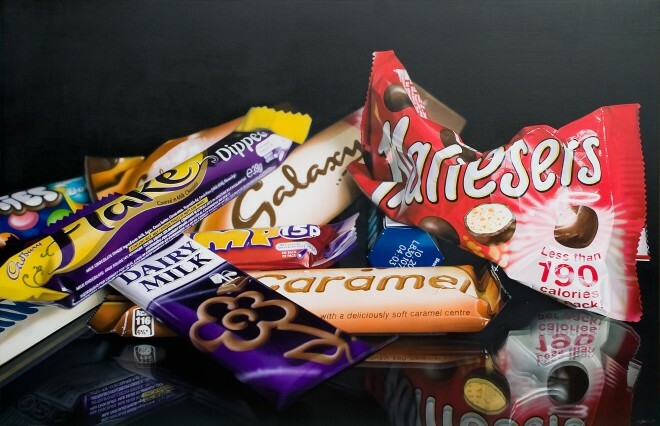 What you’re seeing up there is just one of Tom Martin’s super-realistic paintings of food, and roughly what I had for breakfast this morning (I … I don’t live well.) 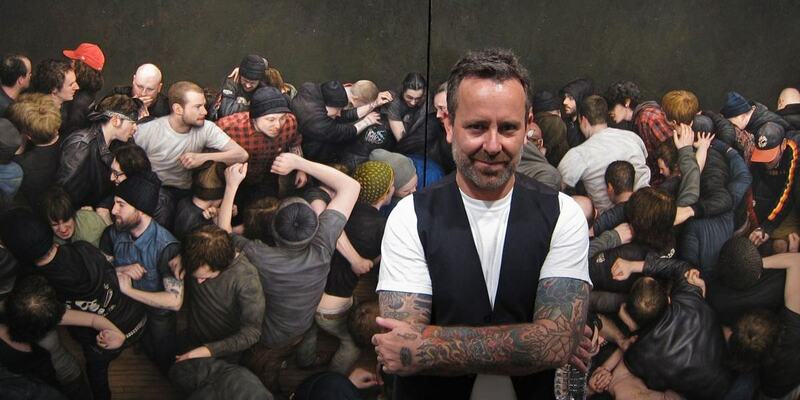 Martin is an English painter who says he gets inspiration for his compositions from his everyday life. Not to judge him or anything, but most of his paintings have been about food; only one is about a girl. Go see her (NSFW) and other mouth-watering paintings of food (NSFD – Not Safe For Diet) over at Martin’s official website. As a hyperrealistic artist, it’s good to have your own thing, that one special talent that makes you stand out from everyone else. Alyssa Monks, as we’ve seen, is really great with water and glass, and Bernardi has apparently never met a shiny utensil he wouldn’t like to paint. Robin Eley’s thing is undoubtedly cellophane, appearing in every one of his paintings in all of its creased, ruffled, light-reflective, realistic glory. In the Australian (UK-born) artist’s own words, the cellophane is supposed to represent modern human isolation, through which we can see but cannot touch. It actually connects well with Eley’s upbringing, when he often felt disconnected from the world around him. Then again, that really doesn’t explain why so many of his models need to be naked. Seriously, one of the main reasons Auspicia made the list here is because it was one of the least naked pictures Eley had on his totes-NSFW website, which you can access here. Just look at that painting by the Spanish artist Pedro Campos. It’s so realistic that I actually tried to reach out to grab one of the cans, and broke my monitor in the process. At least that’s what I’ll claim in court, as I’m suing Campos for damages! Ha, sucker! That’s what you get for being so hardworking and talented. Go and see more of Pedro Campos’ works over at his website, before my lawsuit inevitably shuts it down. Technically, this is not a painting. It’s still way better, though, than the stickmen I used to draw inside my math textbook (and the award for biggest understatement of the century goes to … that sentence!) 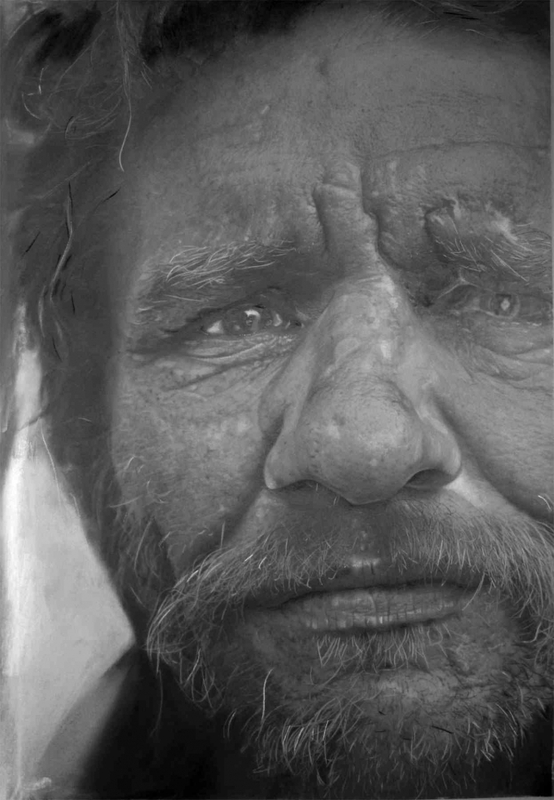 NVA 24 is actually a graphite drawing which, frankly, can only be explained by Paul Cadden being some kind of sorcerer. I’m sorry, but there is just so much talent a human being can have, and Cadden has long flown over that line on the back of a winged T-Rex. Most of Cadden’s drawings usually take 3 to 6 weeks to complete (guess that’s how long it takes for his mana to run out,) and usually sell for up $8,000. Go check out more of his (slightly NSFW) stuff over here. 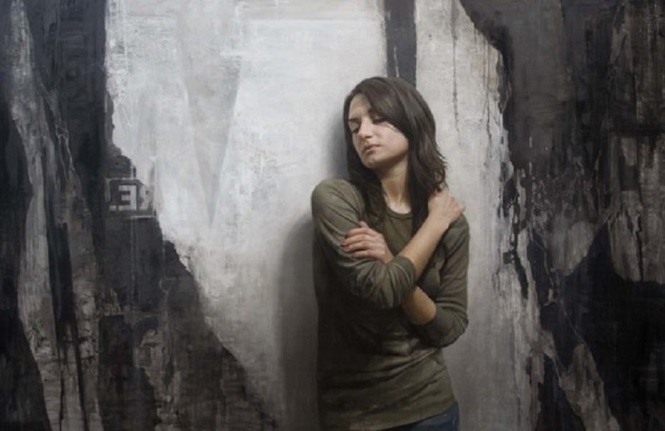 According to people way smarter than me (wow, that narrows it down … ) Kassan’s paintings are great not just because of their hyperrealism, but also because they combine real, everyday, clear-as-a-freaking-photo humans, with abstract backgrounds. And that apparently makes art. But honestly, even if you remove the background, and put Kassan’s characters in front of a Burger King or a rusted sewage treatment facility, it would still be the most impressive, artsy art any artist has ever art-ed. Find out where you can take Kassan’s class on hyperrealistic paintings and see more of his work over at his official website. It’s because of the passion of making art. There is no point. Artists do what they want because it’s who they are. There is imagination in these paintings. The artists have to use their imagination when doing what they do, regardless of the material or source. Who knows what they are thinking while making these pieces. It’s all about the love of the craft and how it pleases the maker of such things. I agree with you. I think the talent is amazing and the attention to detail shows so much skill and patience. I do wish they would use that skill to create interesting imaginative images rather than mundane images that just show their skill. The possiblities are endless with their technical skills, yet they just paint people and everyday objects no different from a photograph. Im perfectly happy with them painting what they want to paint and what makes them happy. Why on Earth would they paint something because “you” feel it is more worthwhile? I guess it’s all about tastes and perception. Art, regardless of what it looks like will always have it’s critics. Art is always up for scrutiny and the opinions of others. Art isn’t complete without a viewer and it’s up to the viewer to decide whether he or she enjoys the work. In saying that this work is absolutely astounding, but weather you enjoy it or not is purely ones own opinion. Like they say “beauty is in the eye of the beholder”. I didn’t say I don’t appreciate these artworks or the hard work put into them. I do. I’m just saying that I don’t need to see paintings of food or Coca-Cola cans, no matter how realistic they might be. I like paintings that have a bit more phantasy in them, like the ones by Pablo Picasso, Claude Monet, Akseli Gallén -Kallela, Édouard Manet, Salvador Dalí, H. R. Giger, etc. If you want something that looks like a photo, take a photo and apply a bit of filter. It makes a pleasant change to see actual art being lauded for once, as opposed to that degenerate horror called ‘modern’ or ‘abstract’. Pieces like that belong in museums dedicated to Defective art. I will admit that art is in the eye of the beholder, but the poor unsuspecting public should be forewarned that it contains pivotal defects. There actually was an exhibition of “Degenerate Art” a couple of generations ago. You will not be happy to learn who sponsored it. What pieces of “modern art” (whatever THAT is) do you find offensive. after seeing Barnardi’s website, it seems hes got a thing for faucets and dishes in the sink..
Abundance of skill but rarely any substance.